We’re in our twentieth year of operating this farm,and have been offering apprenticeship positions for over 15 years, so have acquired experience in teaching the craft of farming over those years. Throughout the season we have mini workshops based on topics that you hope to learn more in depth than what is gained from working along side us in the field. 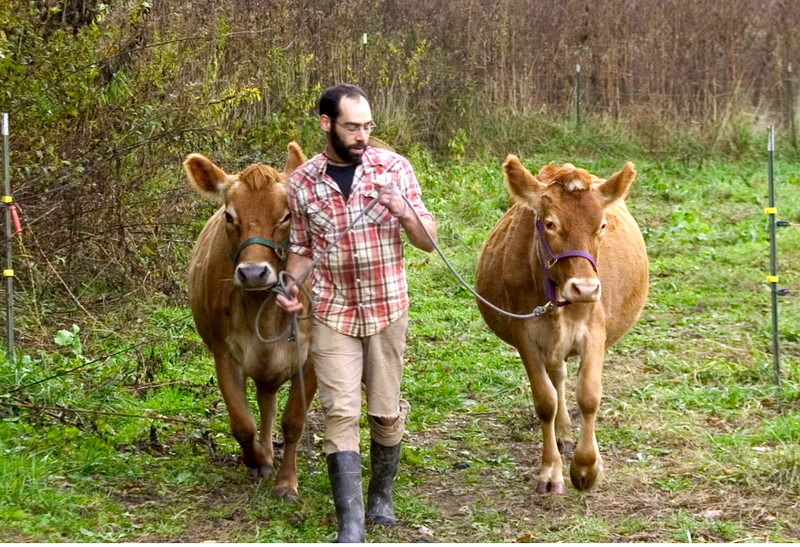 During his apprenticeship, he learned all about keeping a family dairy cow from rotational pastures, daily milking, to cheesemaking. WIth our apprenticeship, we expect hard work, with little monetary reward, but a great satisfaction in working outdoors and living off the land.You will learn by working alongside us, listening, observing and asking questions. 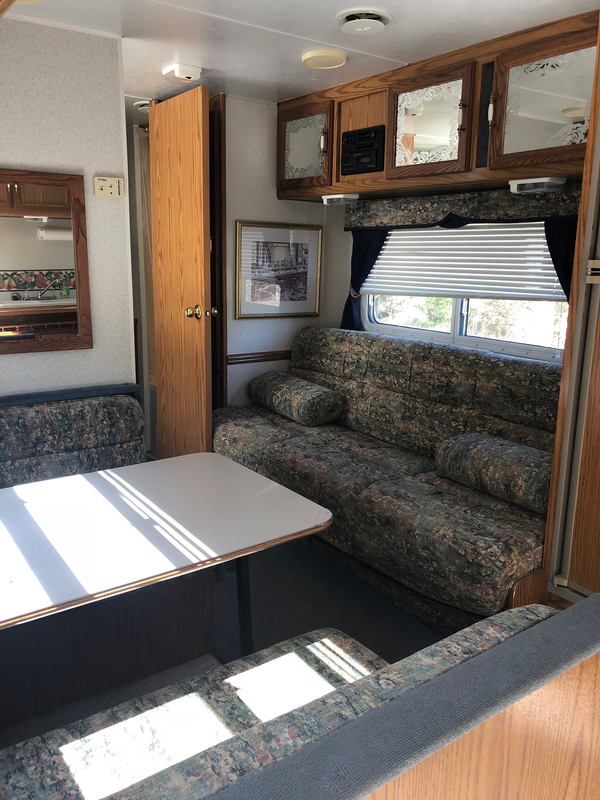 We offer two consecutive days off each week and housing is provided in a fully furnished camper. It would be be like tiny house living for the season! What is an apprenticeship and am I qualified? We hope to help train a new generation of small farmers and homesteaders in the dying trade using on-the-job learning and often some accompanying study (mini-workshops). These skills are something that are difficult to learn in a classroom setting. 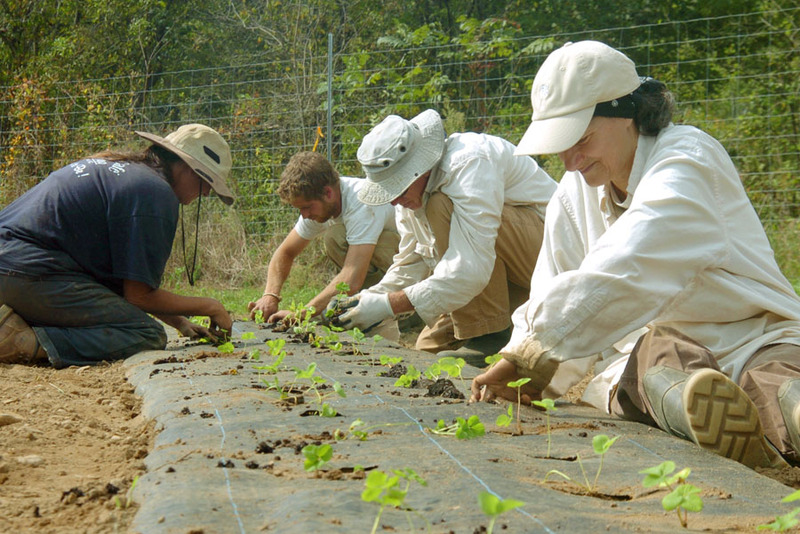 We understand that there is a tremendous amount to be learned about running your own small farm or homestead, so our apprenticeship is all about us sharing our knowledge with you, while you in return help us with every day farm work. What will my work week be like? Our hands-on-learning experience is that you work alongside us for a portion of the day. Our normal work day is Tuesday through Saturday, beginning at 7:30 AM and ending around 5:30 PM.You will have 1 – 1/2 hour lunch break. We typically work between 45 and 50 hours per week. How do I know if I’m a good candidate for Mountain Harvest? Our dream individual would be a creative person who is willing to work 40 – 50 hours per week on the farm, have a sincere interest in homesteading, enjoy working outdoors, positive and willing to share ideas. About half your time will be spent working independently so we expect an individual who is self motivated and has experience working alone. Such work that we expect help with include; general farm upkeep such as mowing and weed eating, growing/raising food for our CSA. We are transitioning from being a strictly production oriented farm, into a blend of production and agri-tourism, so good social skills are required for interacting with guests. We ask for only those in good physical shape to apply, as you will find yourself helping with morning chores such as milking the cow, mucking out barns,, hoeing/weeding in hot weather for long hours at a time, harvesting early in the morning in the rain or shine, bending over hand transplanting veggie starts to the field, fencing, and so many jobs too numerous to mention. We expect help with whatever job is highest priority at the moment, so our schedule is always flexible, because sometimes something unexpected, like a broken fence, may come up that needs addressing immediately. So if your personality fits these character traits, then YES you are a good applicant for Mountain Harvest Organics. Tony, learning the importance of cover cropping! 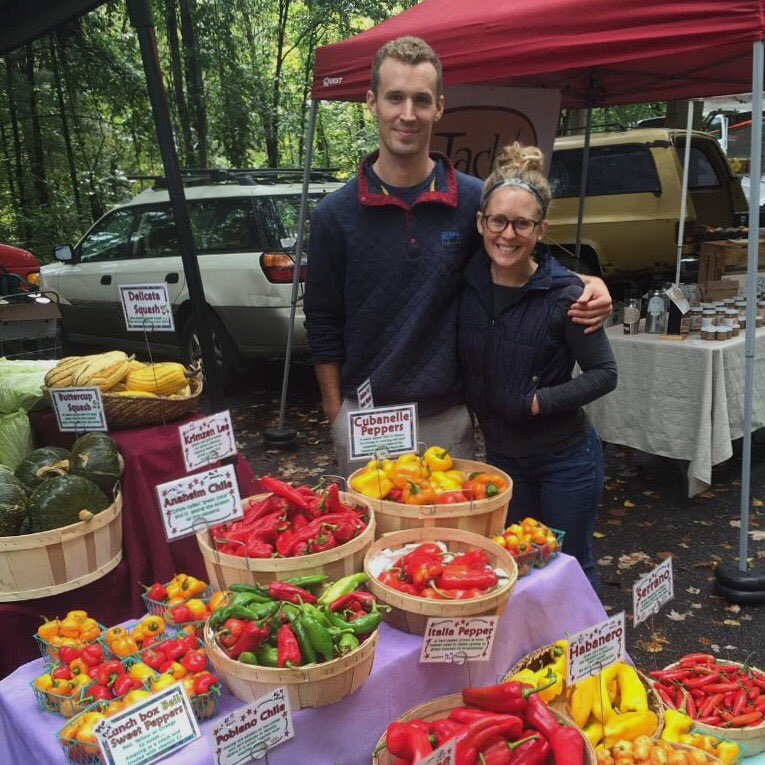 After Tony completed his apprenticeship, he went on to obtain a degree in Sustainable Ag from App State and is now working at the SAS Culinary Farm. What can I expect to learn over a season? the farmers have been offering apprenticeships for over 15 years, and during that time, the farmers have learned tips and techniques in making them better educators. We have 5 greenhouses in production and we grow nearly all of the plants for our production operation from seed. That means you will gain an understanding of what is required for starting seeds, growing transplants, micro-nutrients required in the soil, crops suited for greenhouse and hoop house environments, water requirements of crops grown under those conditions. irrigation, trellising crops, cleanup of spent crops, and cover cropping. You will gain an in depth knowledge with various crops because we are highly diversified and are always looking at refining our production by adding or removing a cultivar. Our primary sales is through a 15 member CSA. Harvest,post harve handling of crops and Marketing. How crops are harvested (over 40 different types of vegetables), cleaned and packaged.In addition, you will gain experience marketing these crops through sales to the CSA and at market. An apprenticeship is all about hands on learning.Many discussions and learning experiences about food production take place out in the fields! We have 3 tractors and implements for mowing, tilling and amending the soil. You will gain an understanding of Tractor Safety, using equipment for fieldpreparation, crop maintenance, crop cleanup. You will gain an understanding of managing a vermi-composting operation and the amount of compost required for a closed-loop farming system. we keep a couple pigs raised on pasture.The pigs make great use of whey and extra milk, requiring less grain inputs than if pigs were raised strictly on pasture. We also keep a flock of laying hens.We are in the process of building a mobile coop, and in the fall of 2018 expect to have chicks, which will give you experience raising chicks for a egg laying operation and the land requirements of pastured poultry. Mountain Harvest is a very self sufficient farm from the perspective if eating what we grow.We will have a class on canning, fermentation and cheese making. just to help give you a feel for what may be required for the start-up expenses ofyour desired farming enterprise. Jane and Andrew, excelled at the marketing aspect of their apprenticeship, as you can see by their beautiful market display! 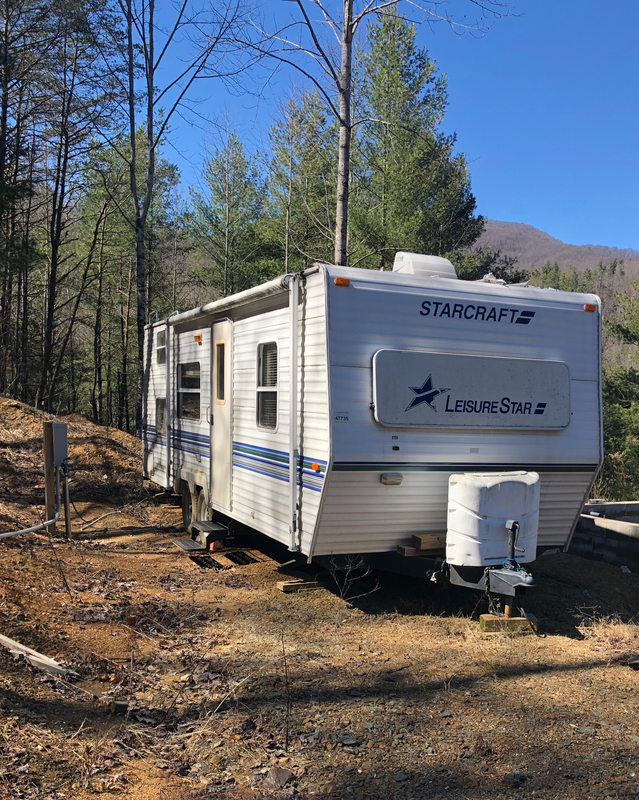 We are in a very remote location, being 20 minutes from the small town of Hot Springs, and an hour from either Asheville or Waynesvile.Many peoople feel we are in a very isolated community, but we love where we live! Will i be provided food from the farm? We think, that after the educational aspect of an apprenticeship, this is among thetop benefits of your apprenticeship.You will get unlimited vegetables, rationed meat and dairy when available. All prime vegetables and cuts of meat are sold to our customers, but we on the farm eat the blemished vegetables and unpopular cuts of meat. We are located in a very isolated area in Rural America, so are descriminated against fair and affordable access to the internet; however, we will provide a small amount of bandwidth to you for communication via email and texting. 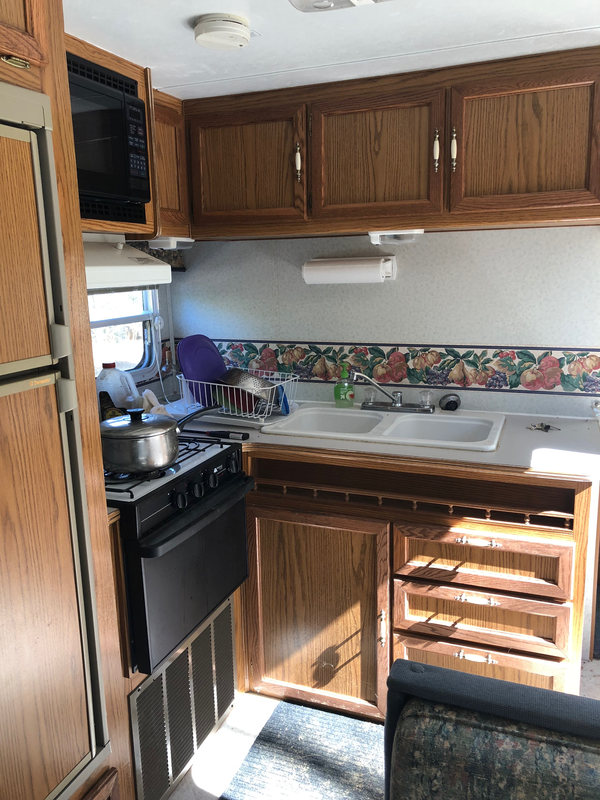 Includes a refrigerator, stove, sink and cabinet space! What is my housing like? We provide a fully furnished camper with electrical, water and sewage hook-ups. Your housing is located at a private setting on the farm. Perfect for a little R&R when you are not outdoors!